Michael Carden kindly gave a talk at BonkersCon about the origins of radio at my request. Tim Ansell was there during the day to record these videos with his bonkers home brew video capture hardware. Sorry about the sound quality at the end of the video. We had some issues on the day with the radio mics, so these videos were recorded with a conference microphone which did admirably as long as the speaker was facing in the right direction. There are a few of these videos that I’ll post in the next little while as I have time to make sure the recording worked out (by watching the video). Thanks to everyone who made Technical Topics 2016 a success. I enjoyed the talks, and I think the turnout was much better than I expected. I’ve also given up on convincing people to use the big boy name for the event, and have accepted that “BonkersCon” has stuck as a name. So congratulations on that! A special giant thanks to those who agreed to speak, video record the event, or flew all the way from places-that-are-not-Canberra to attend. Your commitment to a random idea is impressive to me and I appreciate your efforts more than you can imagine. I’ve included some photos of the event below, with almost all of these having been taken by Richard Jones, so thanks to him as well for documenting the event. Tim Ansell made some videos of the talks, and I’ll put these online separately in the next day or two. Having asked attendees if they’d come to another BonkersCon, the answer was a resounding yes. So, I’m thinking mid-2017 is about the right timing, and you’ll hear more details about that soon. (This just got emailed out to registered attendees of Technical Topics). 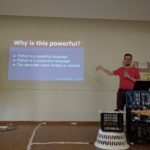 If people who are down for a talk can ensure that they are happy with their nominated timeslot, and have added at least some information to their linked wiki pages for each talk what would be cool. 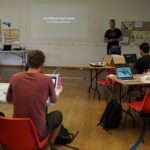 We also still have two full slots free, and some space for lightning talks if anyone else is interested in telling us what they’re hacking on at the moment. I’ll keep pinging people I think might have interesting things to talk about, but having other people suggest things would be cool too. Finally, it would be cool to have a few more people at the event. I’m not worried, but I figure the more the merrier, so if you haven’t let your geeky friends know yet that would be cool too. 1: Or BonkersCon as some of my co-workers have named it. (This got emailed out to registered attendees yesterday). Oh you few, you glorious, trustworthy and foolhardy few! Thanks to all of you who have registered for Technical Topics. I think it is cool (and a bit bonkers) that we’ve gone from idle idea to a conference with a venue, delegates, speakers and insurance quotes in a week. I think a lot of that is because of you super great people who went out on a limb to register early. So far we’ve announced three talks, which leaves us with four more to announce. I assume now that the schedule is a bit firmer and venue confirmed we’ll start to see registrations pick up. That said, I’m happy if we make it to 50 people — this doesn’t have to be an event for thousands. You should have been emailed out a wiki URL, username and password automatically as a side effect of buying a ticket on eventbrite. If that thing hasn’t happened let me know and I’ll fix it for you. The basic idea here is that people can self-organize as much of the event as they want — for example I am not assigning speakers talking slots on the schedule, I am hoping they will pick one which works for them by themselves. Similarly, I am also hoping they’ll put up a wiki page about their talk without a whole lot of hassling from me. Secondly, we do still need more delegates if I am to cover insurance costs, so remember to hassle your friends into coming! I think this is also important because having a few more people will make the event more fun for all involved. Thirdily, you’re welcome to camp over at the Scout Hall on the Saturday night if you’d like. I would like an idea of how many people want to do that though, so please add yourself to the wiki at http://wiki.madebymikal.com/index.php?title=Technical_Topics:December_2016#Wait.2C_its_in_a_Scout_Hall.3F.21.3F if that’s a thing of interest to you. Finally for now, I still need to work out a video projector and screen. Do any of you have one I could borrow for the weekend? Feeling left out? Why not register and come along? Recently I’ve been feeling like I’ve been missing the chance to hear about cool technical projects people are working on in a depth not possible at a CLUG meeting because of time constraints. 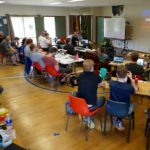 I am therefore running a simple weekend meetup in Canberra on Saturday 3 December and Sunday 4 December. 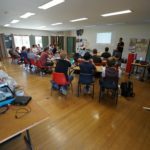 The Saturday of the event will be organised talks, with the goal of the talks being to inspire attendees to have a hack on a new project on the second day of the weekend. The second day would be an unstructured hackfest to explore whatever is interesting after the talks of the previous day. I think reserving the Saturday evening for board games and general “hanging out” sounds like fun too. More details can be found at the conference wiki, with tickets being sold at eventbrite for $20. (The featured image for this post is by hobbymb on flickr). First off, people have bought tickets! In fact, we’ve sold 20% of my original goal of 50 tickets, which is pretty impressive for a conference with no venue or agenda. Thanks to everyone who has made a leap of faith and done that thing. One of the things that I need to sort out is public liability insurance, and I am chasing quotes for that at the moment. Its hard to tell how many tickets I need to sell to cover the cost of that as I have no idea what the insurance will cost yet. In other positive news, a surprising number of people have offered to present as well. The current plan is to try and focus on talks which have a good chance of leaving people to want to have a hack on the Sunday. 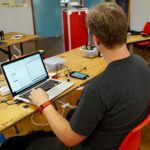 I’d love to be in a place where people have to make hard choices about what to hack on because there is more than one thing that excites them on the Saturday. That said, keep the proposals rolling in to the talk proposals form. That said, I’ve accepted our first talk, which is from Richard Jones. 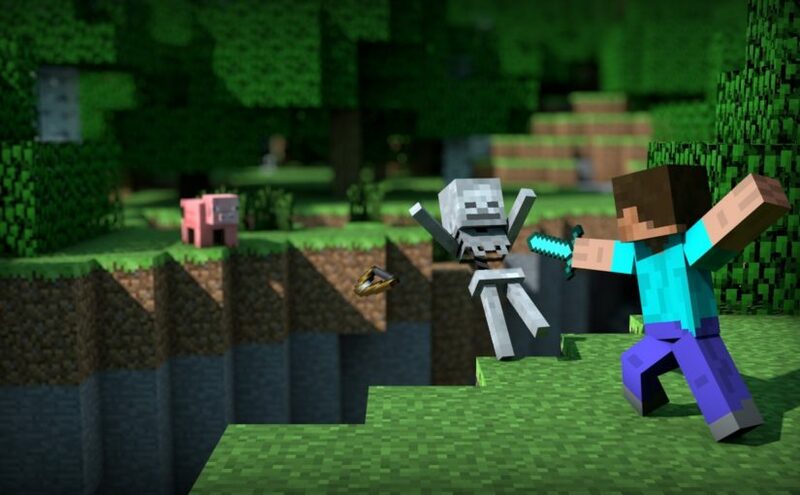 Richard has kindly agreed to come up from Melbourne to run a tutorial on writing Minecraft Mods in Python for people with limited Python experience. I know that’s not super deep technically, but I am excited by getting my own kids into a room with a smart developer with significant teaching experience and I’m hoping other people are too. A reminder of the details — the first Saturday and Sunday in December (3-4 December) in Canberra. 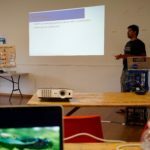 A basic non-conference, with a room, a set of speakers, and a lot of enthusiasm. Only $20 to attend to cover some simple venue costs. So you know what to do people! Use the little box thingie down below to buy a ticket! Recently I’ve been feeling like I’ve been missing the chance to hear about cool technical projects people are working on in a depth not possible at a CLUG meeting because of time constraints. Many years ago, AUUG used to run a weekend “summer conference” that was almost free and addressed some of this issue. That conference died a natural death when linux.conf.au got big, but I think maybe it’s time to bring that back. 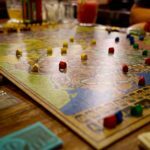 So, I’d like to propose a simple weekend meetup in Canberra. I would make it free, but I feel like the no-show rate is lower for events which charge a token amount. I’m thinking something like $20 is small enough not to be painful, but enough that people will value their tickets. Any profit would be donated to some form of community group at the end, but I haven’t picked one yet. 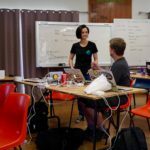 The Saturday of the event would be organised talks, with the goal of the talks being to inspire attendees to have a hack on a new project on the second day of the weekend. The second day would be an unstructured hackfest to explore whatever is interesting after the talks of the previous day. I think reserving the Saturday evening for board games and general “hanging out” sounds like fun too. 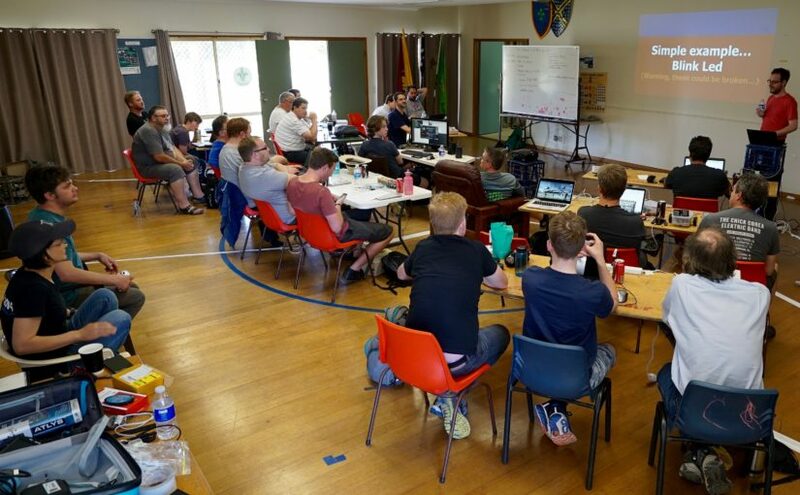 Venue wise, I was thinking of doing something a bit out of left field like hosting the event at Macarthur Scout Hall, mostly because I have easy access to it, but also because it is in a good location with easy parking, cafes and pizza nearby. It would also mean that people could sleep over in the hall overnight instead of paying for accommodation if they wanted to. The venue is not yet confirmed though. Looking at my calendar, I’d like to suggest the first weekend of December as the dates for the event, which is 3-4 December. For the super keen, you can buy at ticket for this super speculative event at eventbrite now — https://www.eventbrite.com.au/e/technical-topics-in-computing-tickets-27377136753 . If the event doesn’t run, I will refund your ticket purchase. 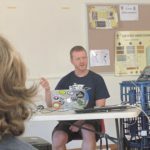 For those with an accepted linux.conf.au 2017 talk it might be a good way to get a practice run in before the big event?